I was very good. About a week ago I went through and weeded out a lot of my paper. I didn't really have a choice because either some had to go or I had to buy another paper holder, which I don't really have room for. So my kids gained a lot more craft paper for their stash. While weeding through I found a lot of paper that I'd forgotten about. I just love this sketch from the Scrappiest and it was perfect for this little bit of paper I had left from this old scenic route line. This is my daughter meeting Terence. Her aunt had to hold her for the pictures because for some reason she was scared of Terence, when just a few minutes earlier she had been grinning ear to ear from meeting Tinkerbell. Glad you got to use up some stash, you did a great job with this sketch! 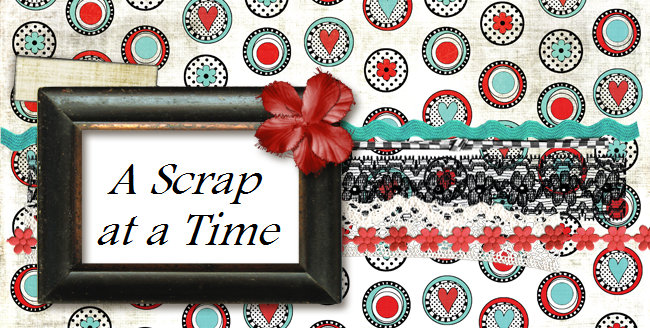 Thanks for joining us at The Scrappiest!